Meet Rornar a shield dwarf who's handy in a battle, in the woods, or both. This fighter/ranger from the Silver Marches has a real problem with orcs -- they keep getting in the path of his hammer. Fun for Rornar, not so much for the orcs. 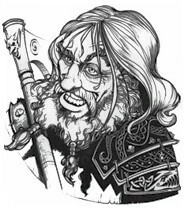 Rornar Gordrinn: Male shield dwarf Rgr1/Ftr4; CR 5; Medium-size humanoid (dwarf); HD 1d10+3, 4d10+12; hp 42; Init +3; Spd 20 ft.; AC 14 (touch 9, flat-footed 14); Atk +8 melee (1d8+5/x3, masterwork warhammer), +7 melee (1d4+1 masterwork spiked gauntlet); or +7 (1d8/19-20/x2, masterwork light crossbow with masterwork bolt); SQ dwarf traits, favored enemy (orcs); AL LG; SV Fort +9, Ref +0, Will +2; Str 16, Dex 8, Con 16, Int 10, Wis 13, Cha 10. Skills and Feats: Climb +4, Craft (metalworking) +2, Craft (stoneworking) +2, Craft (weaponsmithing) +4, Handle Animal +2, Heal +2, Hide +2, Knowledge (nature) +1, Listen +4, Spot +4, Use Rope +0, Survival +3; Foe Hunter (orcs) [+1 competence bonus to damage rolls against orcs within 30 ft. and use Improved Critical with any weapon used against orcs], Improved Initiative, Power Attack, Track, Weapon Focus (warhammer), Weapon Specialization (warhammer). Dwarf Traits (Ex): +1 racial bonus to attack rolls against orcs and goblinoids; +2 racial bonus to Will saves against spells and spell-like abilities; +2 racial bonus to Fortitude saves against all poisons; +4 dodge bonus against giants; darkvision 60 ft.; stonecunning (+2 racial bonus to checks to notice unusual stonework; can make a check for unusual stonework as though actively searching when within 10 ft. and can use the Search skill to find stonework traps as a rogue can; intuit depth); +2 racial bonus to Appraise checks and Craft or Profession checks related to stone or metal (these bonuses are already figured into the statistics above). Favored Enemy (Ex): The ranger has selected orcs as a favored enemy. He gains a +1 bonus to his Bluff, Listen, Sense Motive, Spot, and Survival Lore checks when using these skills against this type of creature. He gets the same bonus to weapon damage rolls against creatures of this type. He also gets the damage bonus with ranged weapons if the target is within 30 feet. The bonus doesn't apply to damage against creatures that are immune to critical hits. Possessions: +1 chain shirt, potion of haste, potion of cure moderate wounds, potion of endurance, dust of tracelessness, masterwork warhammer, masterwork spiked gauntlet, masterwork light crossbow, 10 masterwork bolts, healer's kit, silver holy symbol, backpack, silk rope, traveler's outfit, 340 gp. Rornar is a shield dwarf from the Silver Marches, dedicated to eradicating the hordes of orcs that would overrun his homeland. He is a friendly enough fellow, although he has little tolerance for half-orcs. Dressed in a fine chain shirt and proudly displaying his holy symbol of Moradin, Rornar is a broad-shouldered shield dwarf with thick black hair, fierce blue eyes, and a long, unbraided beard. He knows he is not the most agile of fellows, and rather than sneaking about, he prefers to wait in dangerous areas for his hated foes to come to him. More than willing to join up temporarily with traveling adventurers in search of orcs, he quickly loses interest if they choose to go dungeon delving (unless orcs are known to live there). He is still a young dwarf but looking forward to the day he marries and can be a father to a strong family of orc-slaying warriors, all armed with weapons he made. Rornar fights two-handed in melee with his warhammer and spiked gauntlet, using his crossbow only if he can't close to melee range. He speaks Chondathan, Common, Dwarven, and Illuskan.